Remember the gym and the pool and the hot tub? Today I indulged. It is funny, the social skills it takes to use the pool at the gym. You have to walk out in public in your bathing suit. You have to finesse sharing someone's lane in the pool. Not everyone can do that which is why the pool is never as crowded as you think it will be. Not even in Buffalo, where people like to talk. Not even on a rainy Saturday. I was the only girl in the pool! It was me and four or five guys. They were all nice and I did lazy laps. The only thing missing was, I wished I had a bathing cap. 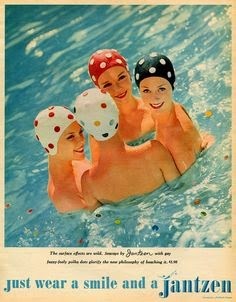 I am in the market for a retro bathing cap (see picture). I kept looking out the tall windows thinking, this is amazing, this place is two minutes from my house, I feel as if I am in this hotel. Except for if I were in a hotel people would be showing up with all their kids and their kids would be doing cannonballs and making all this noise. So this was better. 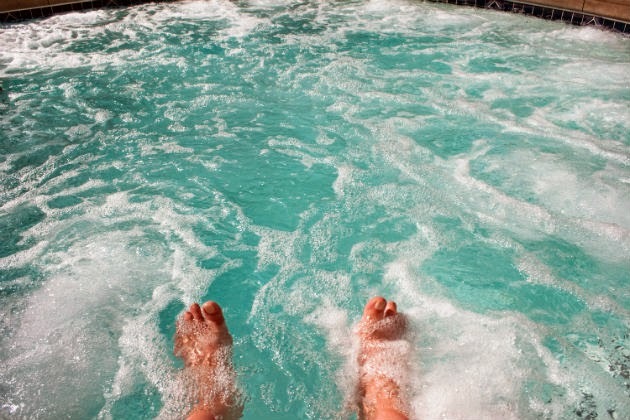 Then --- ahhh, the Jacuzzi. It made me think of California. Leonard loved hot tubs. It made me think of when I was in California on a break from my job and I didn't have to go to work, I mean go to an office. So I sat in the gym Jacuzzi and just enjoyed myself. For one brief shining moment I did not have to be anywhere. It was an amazing feeling. One of the guys who was swimming joined me and we made small talk about how great this pool is, how great it was that although it was this rainy Saturday hardly anyone was here. You can be in a hot tub only so long so eventually I had to get out. "Enjoy the rest of your day," he told me. Which, I did! I wrote a lot and I cooked a lot.